Tel Aviv — Startup Nanofabrica announced that it has developed an additive manufacturing (AM) platform that provides an end-to-end bespoke process for manufacturers seeking micron and sub-micron levels of resolution and surface finish. To date, key AM platform developers have struggled to achieve a resolution under 50 microns, and the few micro-manufacturing AM technologies that exist are either extremely expensive in terms of machine and per-part costs, extremely slow, or have rigid size limitations, said Nanofabrica CEO Jon Donner. Nanofabrica’s AM process is based on digital light processing (DLP), which is combined with adaptive optics to achieve repeatable micron levels of resolution. This tool in conjunction with an array of sensors allows for a closed feedback loop. Nanofabrica describes this as the core technology enabling high accuracy while remaining a cost-effective manufacturing process. 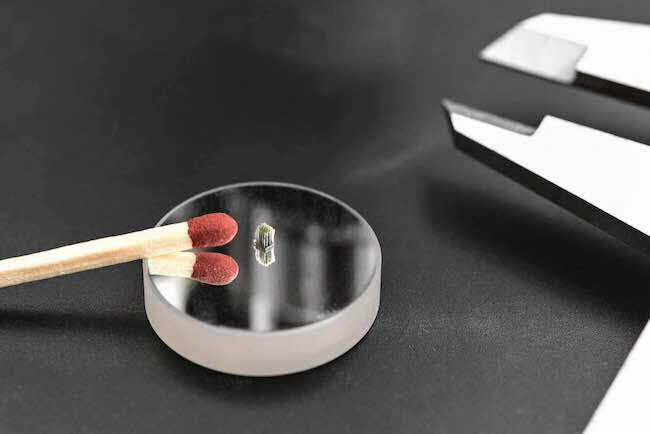 Adaptive optics have been used in other arenas, but this is the first time that they have been applied to AM technology, according to Nanofabrica. Nanofabrica’s AM platform also achieves micron-level resolution over centimeter-sized parts by combining adaptive optics with technology from the semiconductor industry, where precise micron and sub-micron level resolutions are routinely achieved. By working at the intersection of semiconductors and AM, Nanofabrica is able to build large parts with intricate micro details. And it can do so up to 100 times faster than other micro AM platforms through the use of a multi-resolution strategy, which it describes, as follows: Parts requiring fine details are printed relatively slowly, but printing is accelerated in areas of the part where such attention to detail is superfluous. This is enabled through a combination of hardware, which optimizes the relation between speed and resolution, and software that segments the part and printing path into low- and high-resolution areas. Thousands of parts can be printed in a single build on the Nanofabrica platform, making it a true mass manufacturing technology for micro product or component manufacturers, added the company. Nanofabrica also reports that it has developed proprietary materials based on the most commonly used polymers. Founded in 2016, Nanofabrica has identified applications for its AM technology in optics, semi-conductors, micro electronics, micro-electro-mechanical systems (MEMS), micro fluidics and life sciences. Products that may benefit, according to the company, include casings for microelectronics, micro springs, micro actuators and micro sensors, along with numerous medical applications such as micro valves, micro syringes, and micro implantable or surgical devices.